In R334 and later drivers, hover over the Sync card icon. It will show if the Quadro card can support Multi-GPU sync. The smaller pair of numbers is the GPU, Port number. i.e. 0,0 is GPU 0, port 0. This will help you identify which display is attached to which GPU. 3. 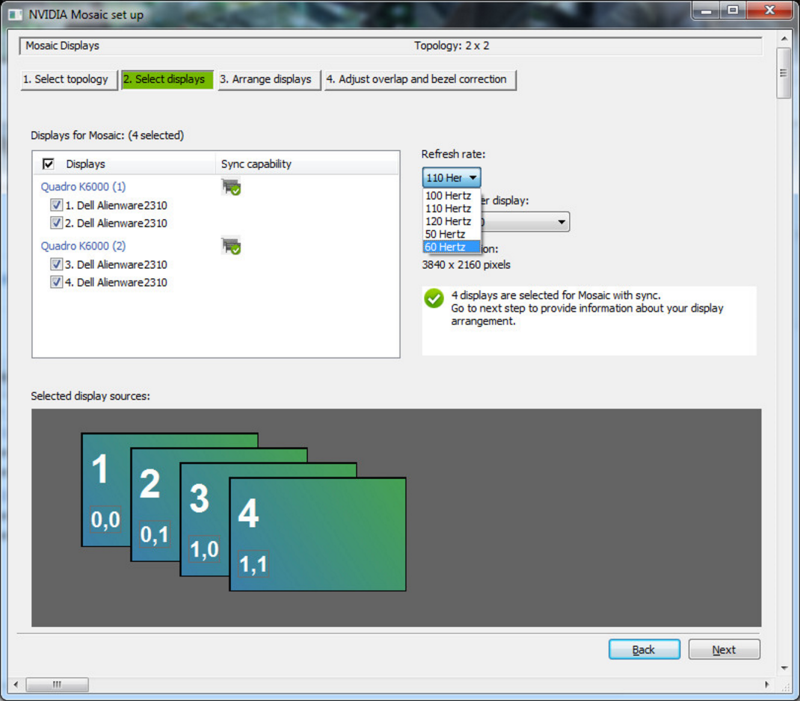 Select "Create new configuration"
This opens the MOSAIC setup wizard. 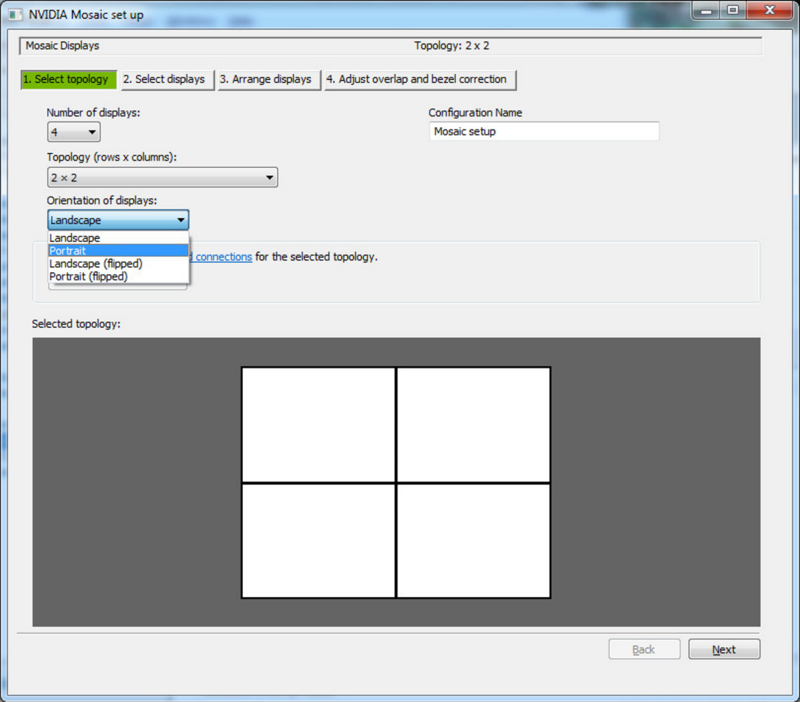 Note: MOSAIC topology uses a grid format to define the layout. 1st page of the wizard asks for number of displays that will be part of the grid. The layout of the grid in terms of row and columns. The orientation of the displays. 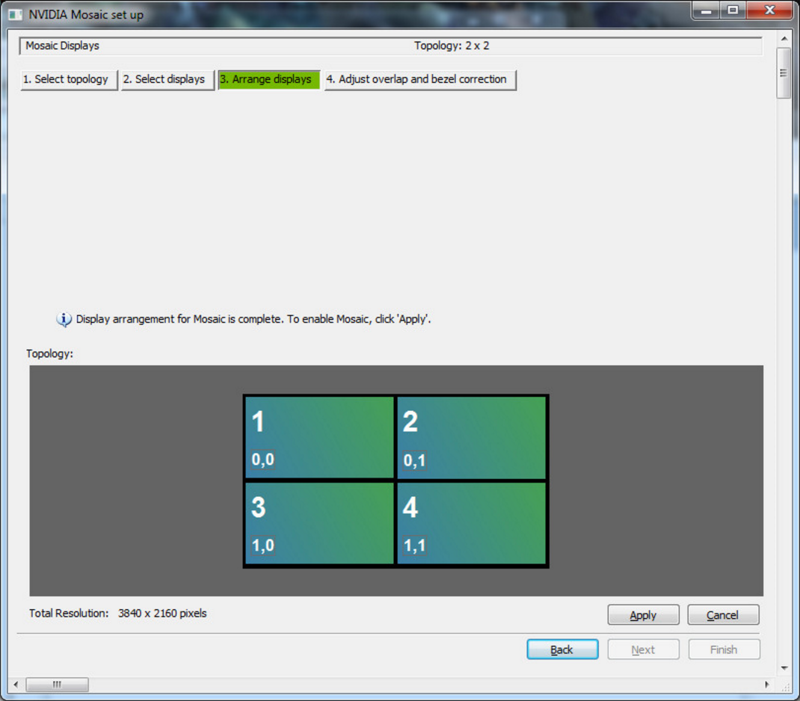 Note: Current driver (R340) requires that you start the Mosaic wizard in Landscape mode and then select Portrait mode. You may get an error if starting the wizard in Portrait mode. We are working on fixing this error. 8. Select refresh rate and resolution per display. 9. Arrange Displays - Drag or enter the display number into the display grid. 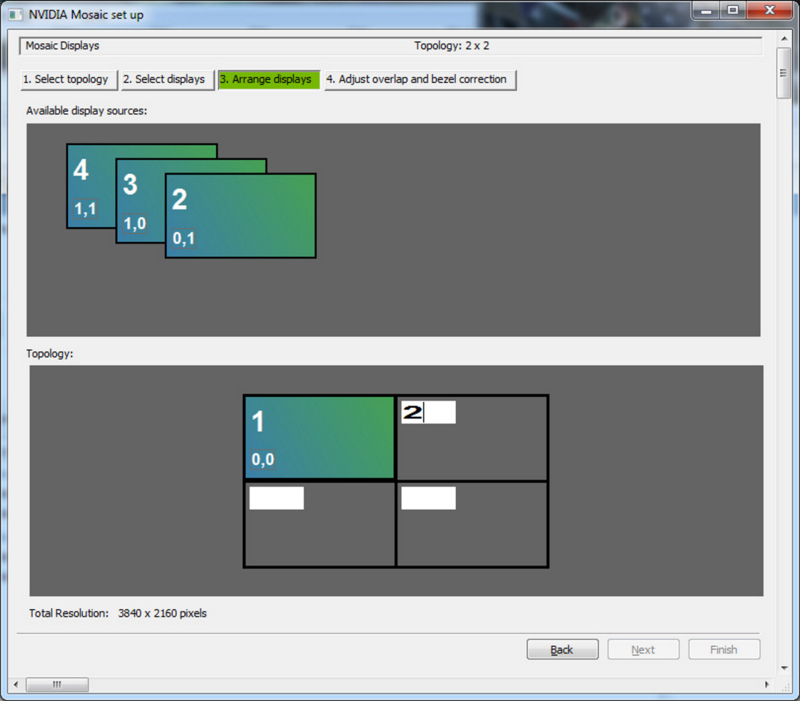 The position in the GRID layout should match what you see with the OSD. 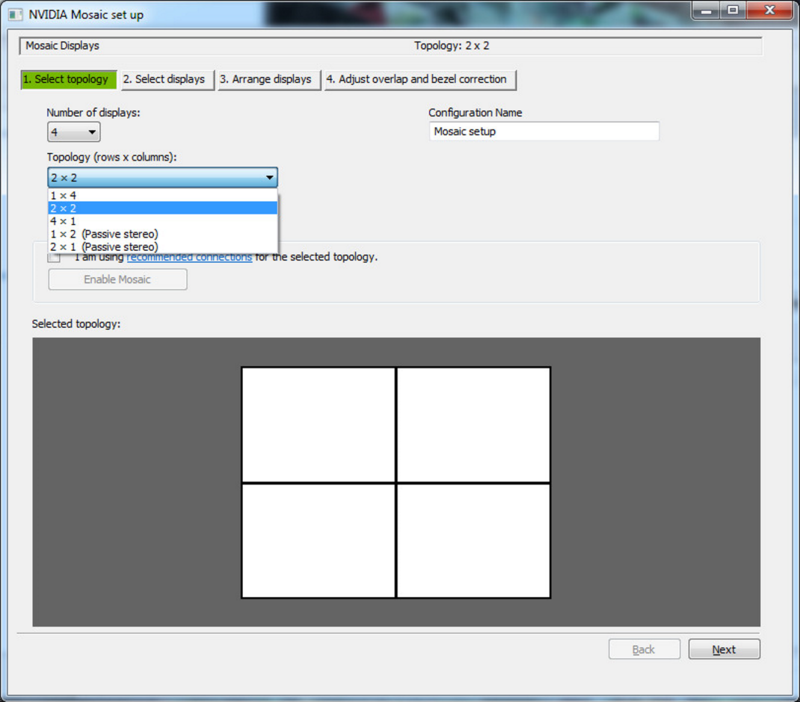 It can take as long as 60 seconds for MOSAIC to be applied. During this time it is expected that the displays will flash. 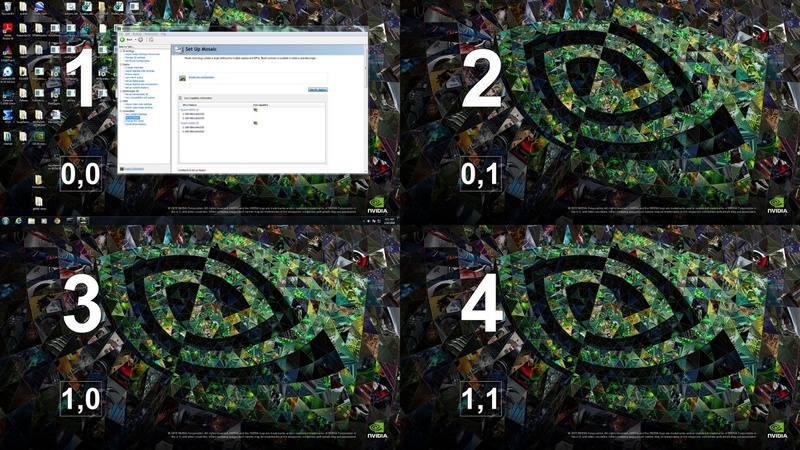 Before applying MOSAIC the driver may ask you to close applications that are currently using the NVIDIA driver. When you set MOSAIC the driver will be unloaded and the reloaded with the new topology. Applications that are currently using the GPU may crash if this happens while they are running. o Try not to use custom resolutions. MOSAIC prefers to get timing from the display EDID. o Check that the total resolution of the display is not going to exceed 16k pixels either horizontal or vertical. 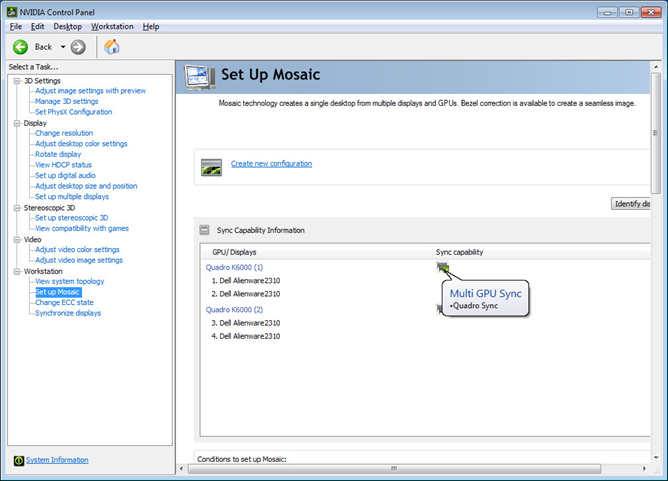 · I can set MOSAIC on a single GPU but not on dual cards. o Make sure that ECC is not enabled on either GPU. MOSAIC across GPUs is blocked if ECC is enabled. o Make sure the GPUs have a SLI bridge - you will require a SLI compatible Workstation. § Only 2 GPUs can be supported in SLI. § Up to 4 GPUs can be supported with Quadro Sync card. · What GPUs are compatible with the Quadro Sync card. o Quadro K4200, Quadro K5000, Quadro K5200, Quadro K6000.